This request undoubtedly was a result of my many posts on calculating alloy densities. It ends up that this equation is quite inaccurate, reading more than 20% low for 10 karat gold and about 5% low for 18 karat gold. It is about 6% low in the 14 to 15 g/cc density range requested (karats in this range go from 16 to 18.) I had wondered if this error was intentional as it favors the recycler. 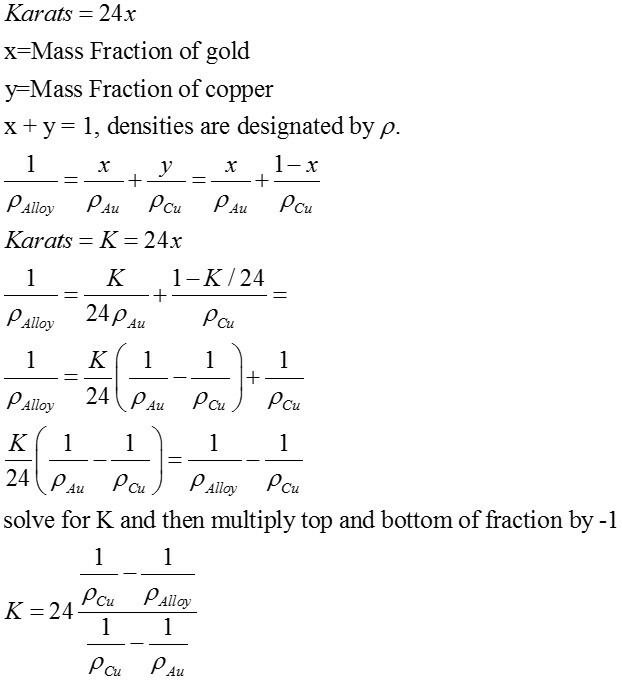 Recently I decided to determine the equation to calculate karats of gold versus alloy density precisely. I don’t believe this derivation has been performed before. The derivation is at the end of the post. Using this equation, I have developed an Excel® spreadsheet to calculate karats of gold in a gold ally. The spreadsheet will calculate karats for any alloying element. One of the issues, which appears many people gloss over, is that this approach only works if the alloying element is known. I assumed for jewelry metal that the alloying element was copper. In addition, no equation can relate density to karats if there is more than one alloying element. This fact makes assaying gold ore in the field with the wet gold technique problematic, as one must assume only one alloying element and must guess what the alloying element is. By using the Excel spreadsheet that I developed, I generated curves of karats of gold versus density for the alloying elements copper, silver, and gold. See Figure 1. 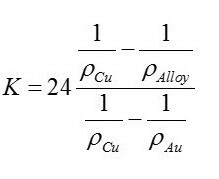 This figure shows that for an alloy density of 13, the karat value would be only 7.5 if the alloying element was lead and about 14 if it were copper. This difference is almost a factor of two! Figure 1. A graph of Karats of Gold versus alloy density for copper, silver, and lead gold alloys. 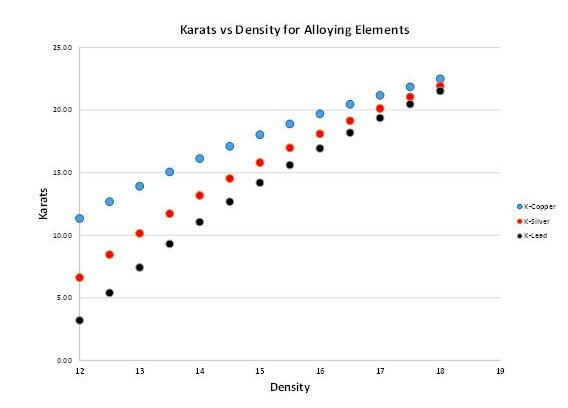 Note how the alloying element affects the karats as a function of density. So these calculations endorse the fact that one must know the alloying element to obtain an accurate karat calculation and the equation only works for one alloying element.